I am a fan of transit maps, but in San Jose, the light rail system is two lines and a little stub. There doesn’t seem to be much consistent bus service, either. Instead, San Jose is a city built around a set of highways. 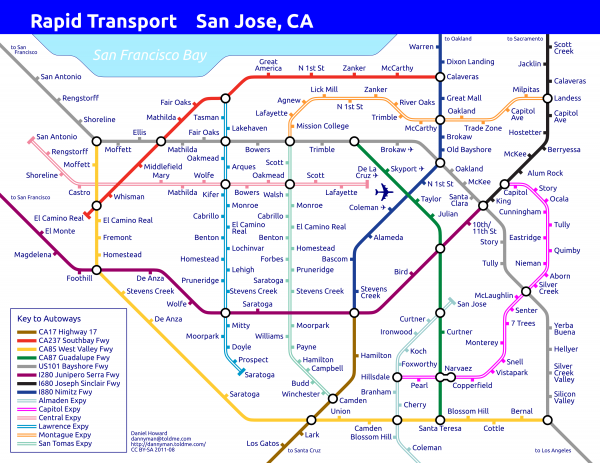 So I built this Harry Beck-style transit map of San Jose’s transportation system. It is designed for printing on a sheet of US letter paper as a quick reference. I’m confident that a better resource would opt for a display of the major roads that comprise the irregular street grid, so you can see what flows to where, turning in upon itself and changing names along the way. I might even build a map like that, but for now, I just wanted to blow a mind or three by rendering highways as if they were a transit system in a clearly iconic fashion. Incomplete interchanges have been omitted, and I’m sure there’s an error in there somewhere. 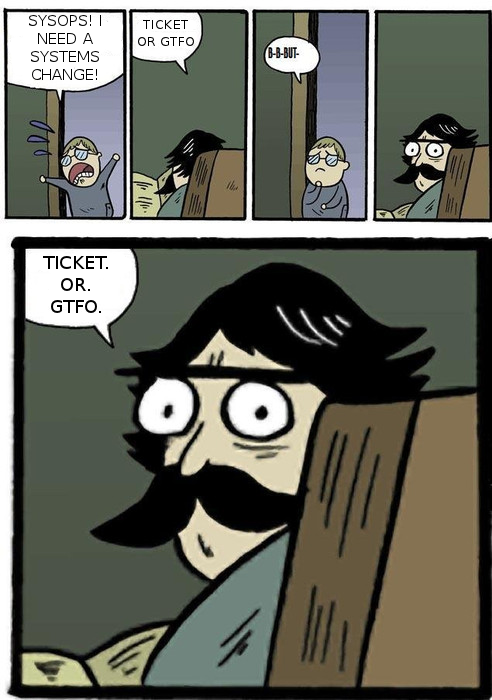 The fare? An automobile and a licensed driver! Update 2011-08-19: Dixon Landing moved North of CA237, San Tomas spelled correctly. Update 2012-06-26: For a future project, check out code by Andrew Godwin for his “Twin Tubes” map. Update 2013-05-23: John Galantini has rendered a Tube Map using HTML and CSS, which is utterly amazing. For example, the little wheel chairs are a list of items, each representing say, the wheels, the back, the arm, all rendered using the CSS box model. I was playing with an idea for someone. 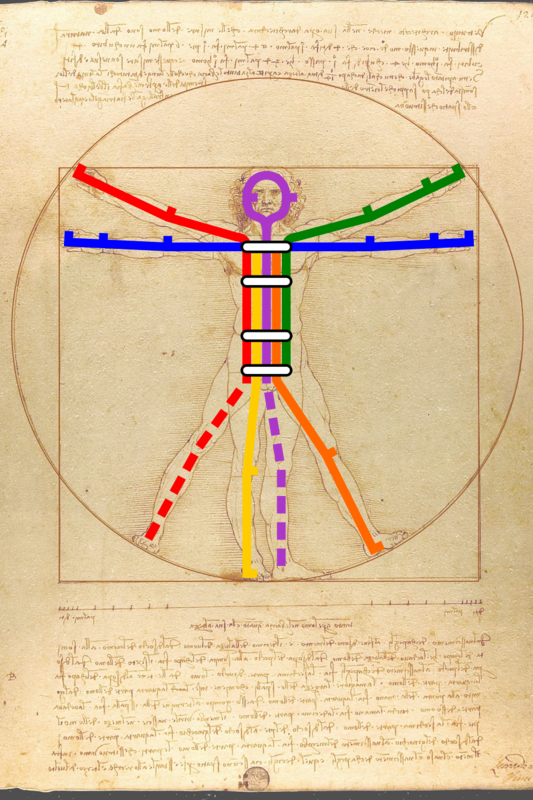 Transit lines laid along Leonardo Da Vinci's Vitruvian Man. The idea wasn’t really working, but I am happy to share it here. You can download the large or 360dpi version from Flickr. 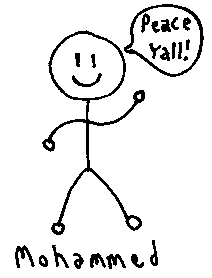 Or you can download the InkScape SVG source file from ratchet. I’m not 100% happy about it, and it is lacking the SamTrans buses I wanted to add. All the same, I’m rather proud. It is train-centric but features connecting bus routes. I managed to include the three levels of rail transit on Market St by consolidating each service into its trunk lines, which let me gloss over the whole KT thing. My original ambition was to populate it with all the landmarks you wouldn’t find on your regular tourist map, but I sort of moved out of town. Alas, I like to think that modifying info on the map should be pretty easy for others to do. The SVG file contains multiple layers that can be turned on or off, modified, add a new layer . . . you could totally create your own map based on this, if you like . . . In selecting the size of this map, I went for a square, because despite its free-wheeling ways, San Francisco is geographically quite square, and figured to make the map 15″ x 15″ . . . if one really wanted to one could slice it in fourths and print 7.5″+ on US Letter-sized paper and voila–your own map! If anyone finds this map useful or hacks on it, please let me know! Enjoy! 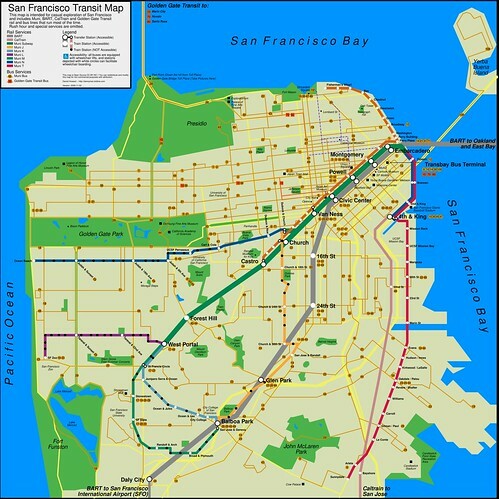 Cool link with other maps: http://www.sfcityscape.com/ — see especially the frequent service map in gif or pdf. Dialogue from two ChinesePod lessons: Can You Use Chopsticks? and Does it Have Bones? ni3 hui4 yong4 kuai4zi ma? Yeah, it has been awhile. This time through, 骨头 threw me for a bit of a loop because the character rendered differently in a certain font. According to my dictionary, 骨 is a compound of a skull-with-vertebrae (冎) over flesh (肉) though the bottom particle is drawn as a moon (月) except in one font it came out with the skull facing right, and the two horizontal strokes in the moon slanted downward in opposite directions to better resemble flesh. This appears to be question of style. Meanwhile, if you combine a dog (犬) with a bone (骨) you get sly (猾). It seems that the homonym 滑, water (水) plus bone is more common but I like that the sly dog gets his bone. The other thing I did is after scanning the drawing I ran the scan through the Potrace bitmap tracing engine in Inkscape, which converted the lines to a vector graphic, smoothing things out somewhat. My bag is too heavy! Hey, it really is very heavy! From ChinesePod: Newbie: Too Heavy! I fall ever further behind. This one I actually drew a couple times and in the end I’m still not super thrilled about the result, but hey that’s all part of the process here. I see my friend 包, as seen in 面包 and the 红包 in “新年好!”. Just as the girl in “新年好!” was invited to 给她红包 the boy here gets to 给包太重了. Thanks, Joe, for nudging me along. Today I went to doodling in pencil, then ink. Scan . . . well, this is all just learning here anyway, so instead of “lineart” I went for “greyscale” then flood-filled the white areas in Gimp. No erasing the pencil marks either. A more laid-back feel. 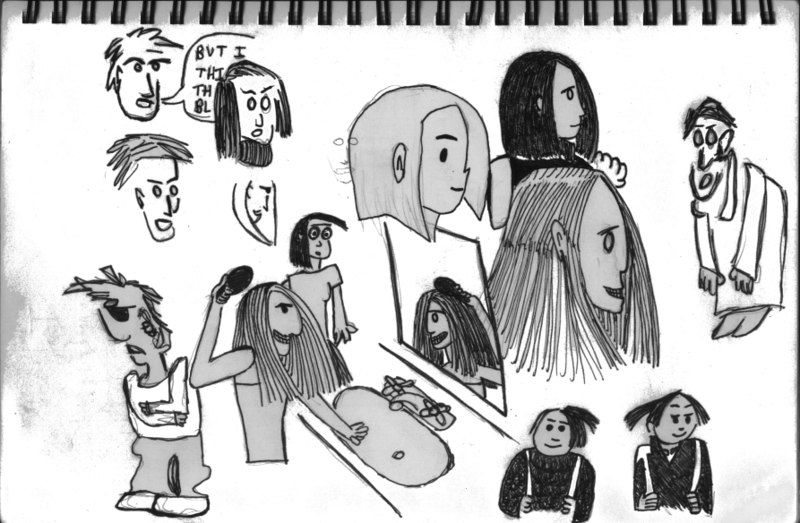 Yes, the theme today is girls and their hair, using Bryan Lee O’Malley’s “Scott Pilgrim’s Precious Little Life” as a guide / inspiration. Also, the girlfriend. My favorite subject above is near the top, just right of center. Based on ChinesePod: Hold the Elevator. 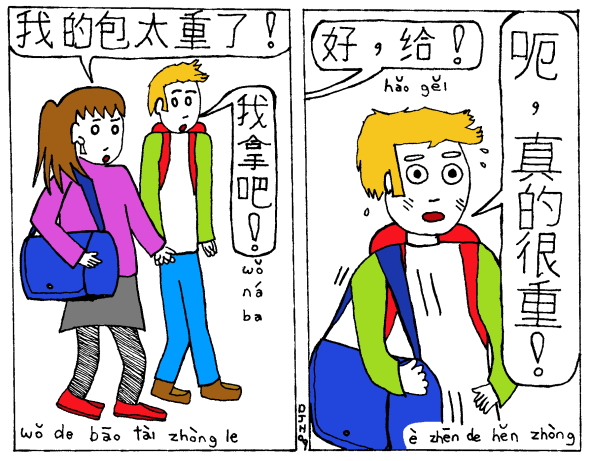 不客气 I like, as I learned it from speaking with Chinese people and because it literally means “not polite” or “don’t be so polite” which reminds me of de nada or de rien. This time I dropped (forgot) the pinyin and just left it out. 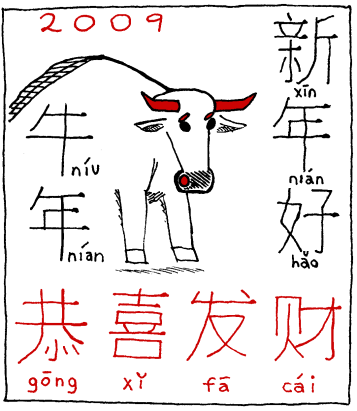 Though I think it is better to include the pinyin: one thing I do is print out the cartoons and tack them to my cubicle wall at work. 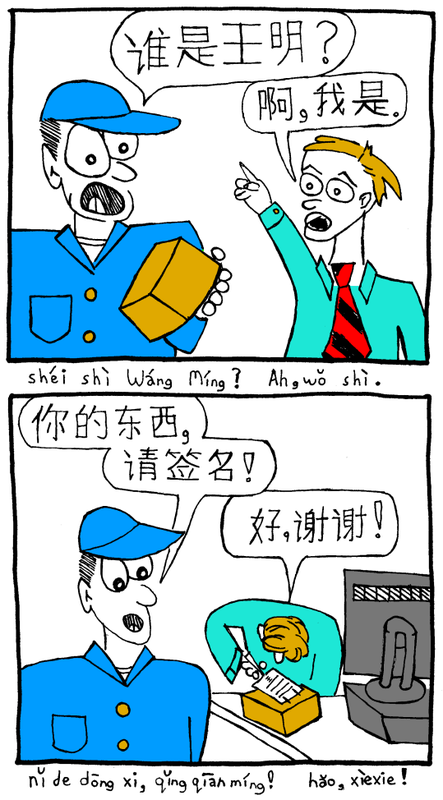 I was also happy to recycle the delivery man from “你的东西”. No, not Chinese. But at least I’m playing with an ethnic stereotype. So, sorta International? I only know Russians who have emigrated to America. There seem to be two types: the incurably depressed and those with a healthy sense of humor. Russians with a sense of humor know that it is all too easy to be a funny Russian, so they try to keep it dry, but they often can not help but smile. That said, nobody I have met has gone full Yakov Smirnov. To be sure, I once asked my colleague if they had Polar Bears in Russia. He said yes, they walk on the street, and they shoot them. He was trying to make me cry! 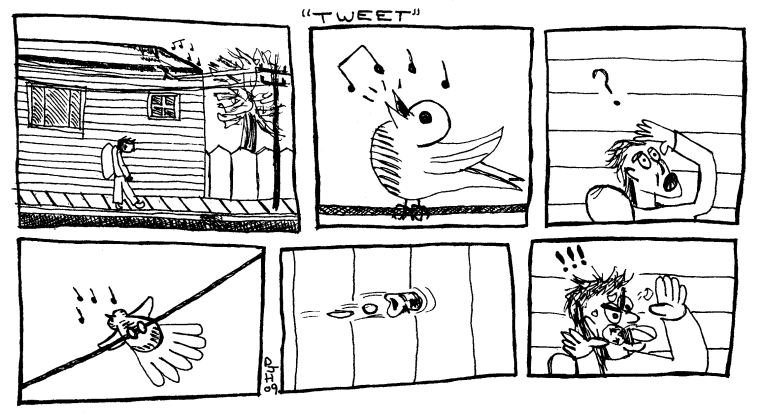 So, this comic strip is dedicated to Vlad. In other news, I swear I smell pot. I don’t know if there’s actually a smell that has infiltrated my house or because I’m listening to Reggea music, and my mind just fills in the gaps. Go go brain! Apologies to anyone whose browser window is fewer than 967 pixels across. Based on ChinesePod Lesson: Sign Here, Please. There is a vastly different courier in the top and bottom panels. The first one is more comical and bizarre, the bottom one more . . . human？ I prefer the bottom figure, but decided against trying to correct the situation. Aesthetically, it is also weird that in the second panel Ming is more in the background. I think that’s okay but in terms of visual narrative, yaknow . . . ? You can listen to the audio to grok what all that means. 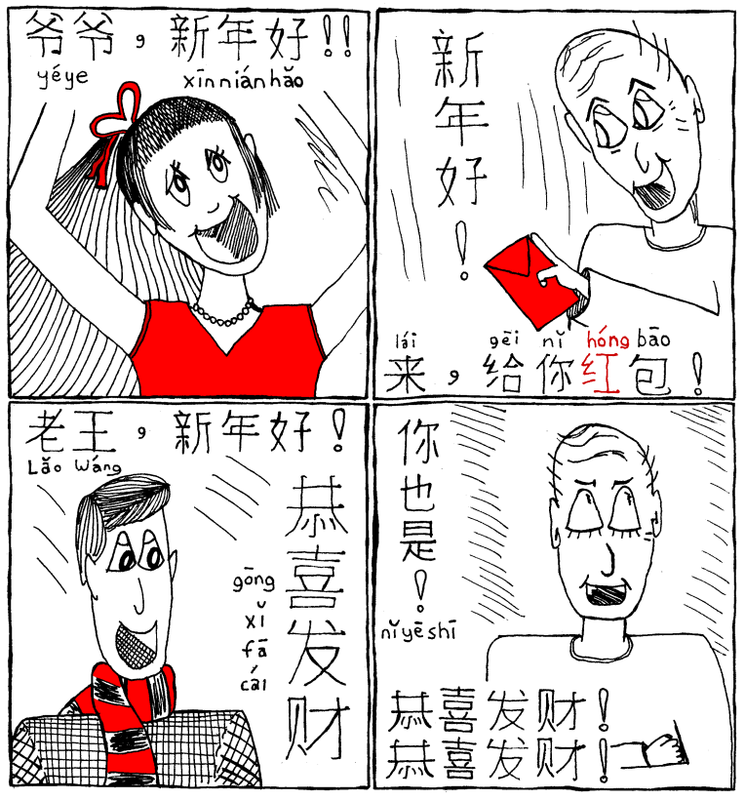 恭喜发财 does not translate well if you take it literally. You give gifts of money to children in red envelopes. 红包! 红 and 包 I have drawn before. 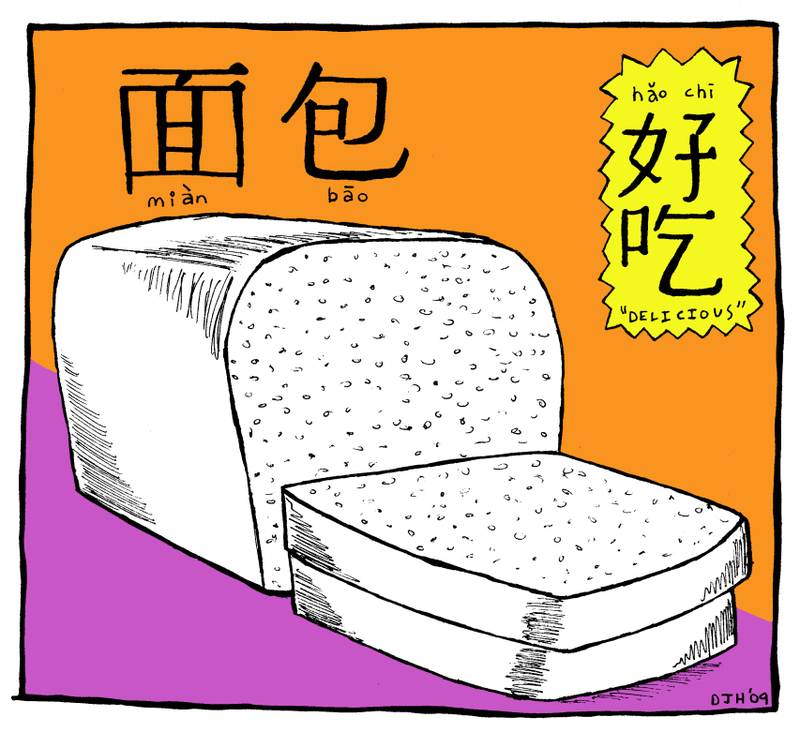 红鱼 is the “red fish” and 面包 is bread. Last night we were at Temple Night Club and I saw a big old 爱 and I recognized it as 发 with more up top. 爱, pronounced ai3 is “love” and saying “I love you” in Chinese is as simple as 我爱你 = wo3 ai4 ni3 . In addition to the Chinese characters, drawing the (Chinese) human characters was somewhat challenging as well. I am most happy with the girl. After trying to figure out how best to draw a “cute little Chinese girl” I ended up basing my character just a teeny bit on Lin Miaoke, the infamous “Beijing Olympics ‘lip-synch’ Girl”. On Thursday evening I met with the Cartoonist Conspiracy San Francisco group. I’m not a hard-core cartoonist but I felt welcomed and I got some practice inking in some panels in different styles. I had wanted to get some thicker lines going, so here I did the characters with a sharpie, other lines, like the bread crust, are inked over about 5 times with my 0.7mm pen. And then we have some actual shading. Whooo! I added the colors after scanning. I effed up in that the slices do not match the shape of the loaf. ChinesePod.com has a lesson on New Year greetings. And of course, red is a good luck color, which is why you give kids money in red envelopes. At least, if you are Chinese. I just give them candy corn.